This Deuter Futura 30 Review is about a top loading pack with a bottom compartment, steel frame, and the best possible ventilation based on a trampoline style mesh. Deuter Futura 30 backpack front view. This Futura 30 pack is available on Amazon, you can currently find it on several of their stores in the US and EU. 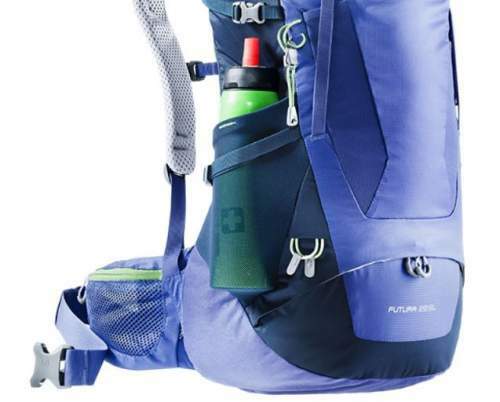 The Deuter Futura 30 is a top loading pack with a lid and collar. But it also has a separate bottom compartment, who would say for such a relatively small pack. You have a true divider between the two compartments, it is with a zipper so you can completely separate the two compartments, or you can unzip it and use the space as a single compartment. The pack is hydration compatible and you have an internal sleeve for the reservoir, with a hose port behind the shoulder harness. The pack comes with a rain cover which has its own separate pocket on the bottom. 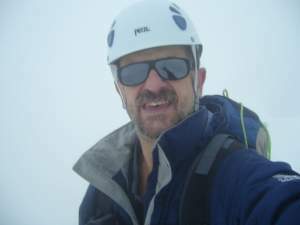 The Futura is the best known series by Deuter. It includes many packs and in several sub-series. So those smaller packs are the normal Futura series like this Futura 28 SL and Futura Pro series, both without the torso adjustment. You can read about the differences between the Futura and Futura Pro in my separate text. 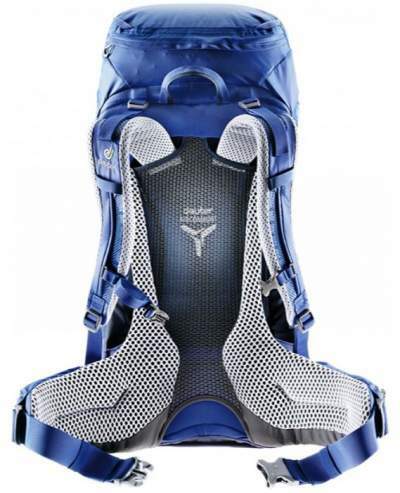 The largest packs in the series are Futura Vario with an adjustable torso size. You will notice also that some of them (those that are in the daypacks size range) are top loaders and some are panel type packs like this Futura 24, the latter group is a more recent trend. They also build versions for men and for women, the latter has the letters SL in the name. 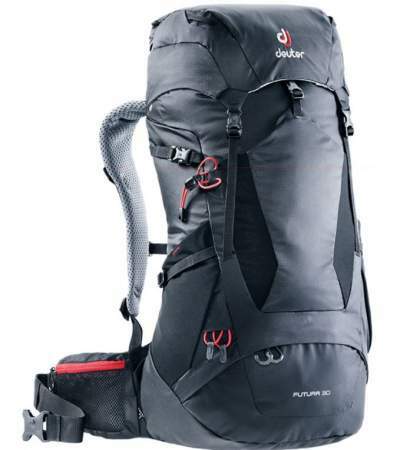 So, for example, this Futura Vario 45 + 10 SL is a pack for women. I myself have been using these Futura packs from 1993. But let’s get back to this Futura 30 backpack. The side view showing how separated the pack is from the tensioned mesh. The suspension is based on a flexible steel spring frame which gives some rigidity and support and it gives tension to the trampoline style mesh which separates the pack from the body. You can see this in the picture above. This is what they call the Aircomfort Sensic System with foam padding columns along the edges of the mesh and with air circulation in all directions. The torso length is not adjustable, except for small tunning with shoulder straps. It is designed to fit 16 – 20 inches (41 – 51 cm) torsos. The shoulder harness is fully padded, and here you have what they call the ActiveFit pivoting S-shaped profile. The hip belt is with a generous padding and incredibly comfortable, see the picture below. This is again an ergonomic Comfort Lock design on hip fins with dual density foam. This same padding continues to the lumbar area where you have pads on the sides and a ventilation mesh chimney in the middle. The front straps on the belt are Pull-Forward construction which makes it easy to fasten and tighten. 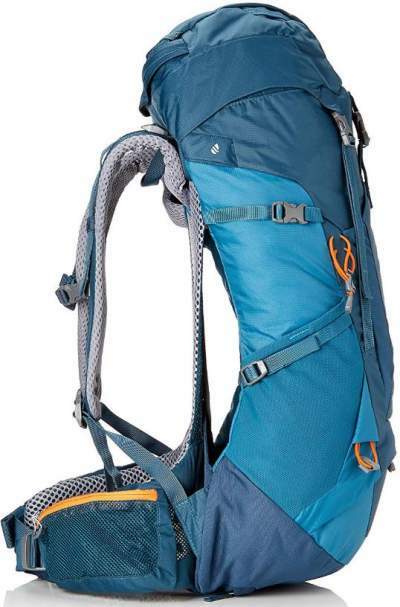 The pack has load-lifter straps and a height and width adjustable sternum strap. So there is not much to object here, the ventilation is at its best. After all, this tensioned mesh system was invented by Deuter and used for the first time on this same Futura series several decades ago, more precisely in 1984. The suspension system with excellent ventilation. The pack has 7 + 1 pockets. Two zippered pockets are on the hip belt, two stretch mesh pockets are on the sides, you can see them in the picture below. The lid has one zippered top pocket and one smaller on its underside where you also have SOS label typical for all Deuter’s pack. One large stretch mesh pocket is on the front. Finally, there is the mentioned rain cover pocket on the bottom. Side pocket, hip belt pocket, and some of the straps. You have dual straps on both sides. The picture above shows the lower strap that keeps the items in the side pocket in place. There are 4 attachment loops on the lid. You have loops for trekking poles and they are paired with bungee tie-offs, visible in the picture above. I already mentioned the steel peripheral frame. The fabric is nylon material in hard wearing 420D and 210D density with PU coating combined with 600D polyester. Type: top loading day pack. Weight: 3 lb 4 oz (1480 g). Volume: 1830 in³ (30 l). Dimensions (H x W x D): 26.8 x 11 x 9.5 in (68 x 28 x 24 cm). Torso fit: 16 – 20 in (41 – 51 cm). So the Deuter Futura 30 backpack is a technical pack with many features that make it suitable for day hiking, but I see it also suitable for travel as well. If ventilation is very important to you, this is definitely a pack to consider. They claim that it reduces ventilation by 25%, and this is a lot. Note that there seems to be a lidless version of this pack on the market, more about this in my separate text. Please note that I am not paid by the manufacturer and do not have any relation with them. If you need more options, check in my page with packs below 35 liters. In the case of questions or comments, please use the comment box below. Have a nice day.